Electronic lock systems are the future of industrial and commercial security these days. You have valuable data, equipment, and products housed within your building — so it’s only fitting to have state-of-the-art electronic security doors installed at all entrance points. Morrill Electric is here to provide electronic security door installation, testing, and replacement services. 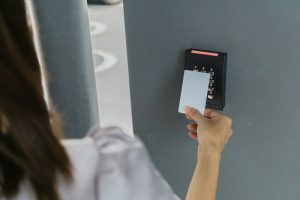 Our institutional electrical security door services also come with the option of alerting law enforcement and the local fire department whenever an emergency occurs. We will help you determine the design and system you need based on your institution and requirements. Contact us to get your institution fully secured.